In addition to discovering personal genetic roots, one of the biggest incentives to order a direct-to-customer ancestry DNA test is the potential of meeting new genetic relatives you never knew existed. Databases of reputable at-home DNA testing providers are growing at a steady pace, so your chances of finding genetic relatives across the globe are constantly increasing. Keep reading this comprehensive guide on the best DNA test for finding relatives to learn how to locate family members around the world. MyHeritage is a DNA testing provider with the most complete portfolio for individuals looking to find as many genetic relatives as possible and complement their findings with genealogical sources. Ancestry.com LLC is the most famous genealogical enterprise in the world that provides its users with precise autosomal DNA testing and ethnic and geographic percentages across 350 regions of the world. 23andMe is the most popular provider of ancestry DNA testing that also includes health-related reports in its testing portfolio and calculates the leftover percentages of Neanderthal DNA in your genome. Living DNA is the most British-centric ancestry DNA testing provider, which makes it an ideal choice for all individuals with strong British descent looking for unknown genetic relatives. Family Tree DNA is a testing provider with the broadest portfolio on the market that includes numerous Y and mitochondrial testing options in addition to the main autosomal test called the "Family Finder." When it comes to finding unknown genetic relatives, the most important factor is the size of your provider’s database. Companies can only compare your personal genetic signature to individuals who already tested with them, so the more DNA samples they have in their databases, the higher your chances of connecting with potential family members. Apart from the size of the database, the availability of your raw DNA data after your sample has been processed is also essential. After you test with one company, there is no reason not test with others and see if you have any relatives in their databases. Every company has different customers, which increases your odds of finding more genetic connections. This brings us to our next ranking factor – whether or not the company allows raw DNA data upload or not. In other words, whether your chosen provider will allow you to use the raw data file obtained from a different company or force you to order its testing kit and go through the sample processing all over again. Most of the reputable testing providers allow data upload from other well-known sources. Creating your personal family tree on your account with a specific provider is definitely a convenient nice-to-have that allows you to create a neat overview of your newly-found relatives. However, the absence of a family tree integration is not a deal breaker as long as the company offers to compare your DNA signature to other profiles in its database. Genealogical sources are also very useful since they sometimes allow you to follow the paper trail that can lead to some unknown ancestor who died long before DNA analyses were available. People usually underestimate genealogical documents, but they can provide valuable insight into your past and shine some light on the secrets DNA testing cannot uncover. Finally, we also take numerous user-oriented factors into account, including the price of the service, the ease of the sample collection process, the average turnaround times, the quality of customer support, and more. MyHeritage is one of the most famous ancestry DNA testing providers on the globe that complement its screening options with numerous genealogical sources. The company was founded in 2003 in Bnei Atarot, Israel and has since opened corporate offices in New York and Utah. Apart from detailed personal ancestry DNA testing that examines 690,000 genetic markers within your genome, MyHeritage provides you with more than 2.5 million user profiles, around 9 billion historical records, and over 40 million user-generated family trees. Note that MyHeritage DNA test only explores your autosomal chromosomes, which means you will not be able to obtain any specific information regarding maternal and paternal family lines. MyHeritage is accepted by GEDCOM, so you can upload your raw DNA data there. The company provides you with the possibility to download your raw DNA file after testing and use it with other providers. On the other hand, it also accepts testing results from all major companies, including Ancestry, 23andMe, Family Tree DNA, LivingDNA, and others. The company also provides you with an advanced chromosome browser tool that allows you to compare individual or multiple chromosomes with your potential genetic relatives. You can opt for a monthly or yearly subscription model – and the option you choose affects how many people you will be able to add to your personal family tree, whether you can use the premium Family Tree Builder and enhanced Smart Matching features, and whether you will have access to priority email support, a tree consistency checker, Instant Discoveries, and more. The MyHeritage test uses a simple cheek swab to collect your DNA sample and the results are usually generated within 3-4 weeks. Ancestry offers one of the best DNA testing solutions on the market paired with the biggest genealogical database in the industry. The company was founded way back in 1983 in Lehi, Utah and has since sold more than 14 million DNA testing kits. The test checks 700,000 genetic markers in your genome and the company complements the results with more than 10 billion genealogical sources ranging from old documents and newspapers to vintage photos and diaries. Ancestry.com LLC also runs a number of subscription-based genealogical websites and currently has around 3 million paying subscribers. The AncestryDNA test covers reference groups from 350 regions worldwide, which means your DNA is compared to genetic signatures stemming from 350 different areas around the globe. The regions with the largest match coefficient are the ideal location to start looking for potential family members. The company’s database currently features well over 10 million DNA profiles. Ancestry will provide you with a GEDCOM-friendly raw DNA file you can use to search for genetic relatives with other companies. However, you are not allowed to upload and use your testing results obtained from other providers. In other words, you have to order the AncestryDNA testing kit and go through the entire testing process. Ancestry provides its users with an advanced family tree-building tool as well as numerous other functionalities, including ethnicity maps, DNA Circles, “Map and Locations” maps, and more. It does not feature any type of chromosome browser. The test kit features a simple container designed to collect your saliva in order to extract a DNA sample for further processing. The average turnaround time is between 6 and 8 weeks. 23andMe is one of the rare ancestry DNA testing providers that also offers health-related examination with more than 70 different reports included in the final results. The company was founded back in 2006 in Mountain View, California and it was declared to be the invention of the year in 2008 by Time Magazine. The 23andMe test examines more than 570,000 genetic markers in your genome and covers 150 regions worldwide. On the other hand, the company does not offer any genealogical resources, but you can use your 23andMe test results to obtain them from many other companies. Being the most popular ancestry DNA testing provider, 23andMe’s raw data files are accepted by almost all other companies on the market. 23andMe’s user database has grown significantly in the past couple of years and it currently features more than 5 million DNA profiles. The company does not provide its users with the ability to create their personal family trees. The DNA testing provider allows you to download your raw DNA data file, but you cannot upload it to GEDCOM. However, it is accepted by GEDMatch. The ancestry part of the test will provide you with your ancestral timeline, haplogroups, and Neanderthal DNA leftovers. However, you will not receive any advanced tools, like a chromosome browser or migration and location maps. The 23andMe ancestry test kit is designed to collect your saliva sample for further processing and the average turnaround time is between 6 and 8 weeks. LivingDNA is a well-known company founded in 2016 by DNA Worldwide Group out of necessity for more precise genetic ancestry testing. Its parent company worked with Family Tree DNA and Scotland’s DNA in the past and collaborated with people behind the British Isle Study of 2015. Apart from this, LivingDNA is partnered with more than 100 world-leading scientists, genetic experts, and academic researchers. The LivingDNA test examines 650,00 genetic markers in your genome and covers 80 geographic regions worldwide. The company is famous for its extensive coverage of the British Islands, which are represented with 21 different regions. In other words, LivingDNA is the best possible option for individuals with British descent. The company has just recently implemented its beta version of the cousin matching system and its database is still not up to par with the previously mentioned providers – but it is not just the size of the database that matters; the geographic coverage also plays a major role in finding lost relatives. On top of that, LivingDNA is currently collaborating with the team behind Find My Past to provide its users with an advanced cousin-matching and family tree integration experience. The company also provides you with your personal raw DNA data file, which you can upload to GEDMatch to search for potential relatives. Additionally, you can also upload raw DNA data from Ancestry, MyHeritage, 3andMe, and Family Tree DNA to the company’s website. The LivingDNA test uses a mouth swab to collect buccal cells from the inner sides of your cheeks in order to extract a viable DNA sample. The average turnaround time is between 10 and 12 weeks. Family Tree DNA is one of the best providers of ancestry DNA testing founded back in 1999 as a division of Gene by Gene located in Houston, Texas. 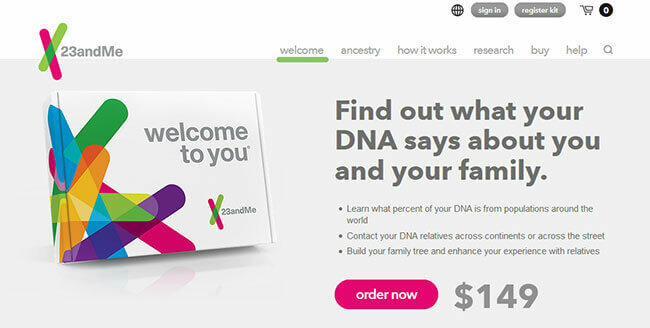 This gave it a huge head start since its parent company had more than 5 million DNA tests performed at that moment. Family Tree DNA offers multiple testing options, but the main ancestry test, conveniently named “Family Finder,” examines 690,000 genetic markers and covers 22 geographic regions. Apart from the main autosomal test, Family Tree DNA also features different variations of Y and mitochondrial tests for those who want to explore paternal or maternal lineages more closely. Family Tree DNA will generate your personal raw DNA data file and it also accepts results from other companies, including Ancestry, MyHeritage, and 23andMe. Apart from this, the company has forged numerous partnerships over the years, including those with iGenea, African DNA, Eastern Biotech & Life Science, MyHeritage, and DNA Worldwide. The results of the Family Finder test feature a mapping tool that gives you a full geographic and ethnic background of your genetic ancestry, a full migration map of your ancient ancestors, a chromosome browser, and, most importantly, the enhanced family matching feature that allows you to sort confirmed genetic matches by maternal and paternal lines. The size of the company’s database currently sits at around 1 million user profiles. The Family Tree DNA test kit uses a mouth swab, which means it is designed to collect buccal cells. The usual turnaround time is between 4 and 10 weeks. As always, the best DNA test for finding relatives depends on your personal expectations and circumstances. If you are just looking for a company with the largest database, Ancestry is the way to go without a doubt. If you want to complement your genetic testing with billions of genealogical sources, Ancestry and MyHeritage are ideal choices. If you know you have a strong British genetic background, LivingDNA will provide you with the best coverage of the British Isles. 23andMe is perfect if you want to combine your ancestral research with some health-related reports. Finally, Family Tree DNA is the best option if you also want to explore paternal and maternal lineages with dedicated Y and mitochondrial testing options.